Chehel Sotoun (or 'Chihil Sutun')  is a pavilion in Isfahan, Iran. It is in the middle of a park at the end of a long pool. It was built by Shah Abbas II for his entertainment and receptions. In this palace, Shah Abbas II and his successors would receive dignitaries and ambassadors, either on the terrace or in one of the stately reception halls. The palace has many frescoes and paintings on ceramic. Many of the ceramic panels are now in the possession of major museums in the west. They show specific historical scenes. There are also aesthetic compositions in the traditional miniature style which celebrate the joy of life and love. The Chehel Sotoun Palace is among the nine Iranian Gardens which are registered as one of the Iran’s 17 World Heritage Sites. 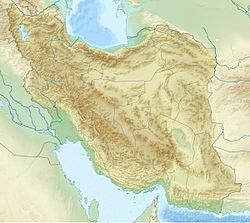 The nine gardens go by the name of "The Persian Garden". ↑ Landor, Arnold (1902). Across coveted lands. London: Macmillan. p. 323. ↑ "Otraq.com, Iran's Tourism Guide"
This page was last changed on 25 February 2019, at 17:46.